Food and agricultural technology could be producing billion-dollar ‘unicorn’ companies within the next five years, according to Akkharawit Kanjana-Opas, assistant vice president at Thailand’s National Science Technology and Development Agency and chief executive officer of FoodInnopolis, who is responsible for developing the country’s next generation of food-tech talents. To avert disaster, he says, innovation will need to be brought to bear on all levels of the food value chain, from improvements in plant and animal breeding and closed-loop farming systems at the production level, to new methods of processing, such as high pressure pasteurisation—all the way to innovation in the kitchen. “We are seeing only certain species of plants and animals that are used for food in the market nowadays, whereas we have a great biodiversity worldwide,” he says. “We are seeing a trend of not only science and technology innovation, but of culinary innovation. Chefs are starting to exploit local ingredients,” he says. Many of these innovations are coming to market now. Asked to predict which would the most likely to produce unicorns, Kanjana-Opas pointed to data-enabled, digital agriculture. Kanjana-Opas’ role is to help local academic institutions, startups and small businesses to identify and commercialise innovations that could help the country—already an agricultural powerhouse—to build a new technology-enabled industry. FoodInnopolis provides incubation and support to tech companies and academics to help them reach a scale where venture capital might become available. That money is there, just waiting for proven technologies, Kanjana-Opas believes. 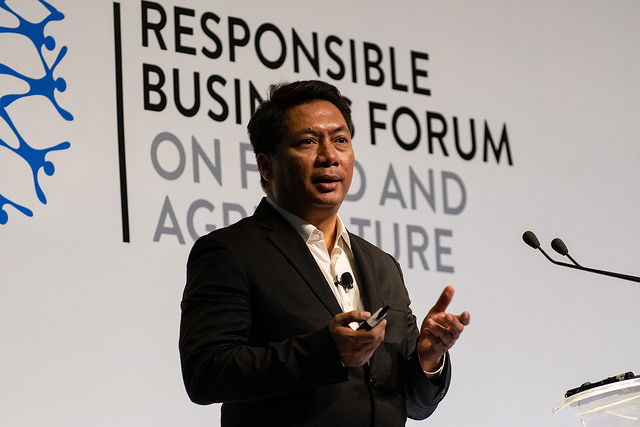 Akkharawit Kanjana-Opas spoke at the Responsible Business Forum on Food & Agriculture 2019, held from 26-27 March in Bangkok, Thailand.